Protein forms a critical component in our pathway to achieving global sustainability. Its role within nutrition and environmental impact offers a double-edged sword: it’s essential, but currently comes at a significant environmental cost. Protein is an essential component of nutrition—it is crucial for growth and maintenance of the human body. There are nonetheless large inequalities in protein availability and intake across the world. This is not only reflected in total quantity of protein, but also its quality. High-quality protein is that which has high digestibility, and contains a sufficient and complete range of essential amino acids. Food products vary significantly in terms of their protein content and quality. A key and widely-used measure of protein quality is the Protein Digestibility Corrected Amino Acids Score (PDCAAS), which scores food products based on protein digestibility and amino acid profile (ranging from 0 to 1.0, where 1.0 is the most complete). Animal-based products (including meats, eggs, dairy and seafood) tend to be rich in protein and have a very high PDCAAS score (typically in the range 0.9-1.0); pulses and legumes also score highly (0.7-0.9); whilst cereals and grains have low scores typically of 0.4-0.5. Ensuring everyone has access to affordable high-quality protein is therefore crucial to meeting the UN’s 2nd Sustainable Development Goal (SDG) of ending all forms of malnutrition by 2030. There are large inequalities in protein availability across the world—many countries overconsume, while in others large deficits remain. As shown in the chart below the global average per capita availability is just over 80 grams per person per day (requirements vary depending on a range of personal and individual factors, but the average adult typically requires around 50 to 60 grams per day as a minimum). However, if we explore this trend by country (you can do this using the ‘change country’ option on the chart below) we see large global variability. In high-income countries (largely across North America, Europe and Oceania), we see protein intakes over 100 grams per day. This is well in excess of requirements. At the other end of the spectrum, we see average availability almost half of this figure—in India, for example, average availability is around 60 grams per day. But it’s not only the total protein quantity that matters in this case—protein quality also differs significantly, with an important impact on nutritional sufficiency. In countries with high protein intake, around two-thirds of dietary protein comes from animal-based products (which have a high PDCAAS score). In the case of India, 80% is sourced from plant-based products (mainly cereals, from a cereal-dominated diet). These sources are typically low in protein quality—once corrected for digestibility and amino acid profile, the average protein availability will fall below requirements. This means many are currently suffering from protein deficiency. This pattern is true across most lower-income countries, especially within South Asia and Sub-Saharan Africa. Increasing the availability of high-quality protein across lower-income countries in particular is therefore an important target for addressing malnutrition and improving health outcomes. Over the last 50 years in particular, this has been achieved through increased meat and dairy intake. Global meat production—as we see in the chart below—has grown rapidly over the past 50-60 years, increasing from around 70 million tonnes (just over 80 Mt if you include eggs) in 1961, to just over 300 million tonnes (370 Mt including eggs) in 2013. That equates to a four to five-fold increase over this period. If we look at UN FAO projections to 2050 (as in the chart below), we see a continued increase in meat demand—reaching 455 million tonnes of meat alone (not including eggs or seafood). Some projections put this figure at a doubling of animal protein demand by 2050. What is driving this increase in meat and animal protein demand? There are two key driving factors for increased meat demand: population growth and increased meat demand per person. The latter of these is primarily driven by economic growth and urbanization trends. The UN projects that by 2050 global population will approach 9.8 billion people. That’s around 2.5 billion extra mouths to feed from today. This will have obvious implications for global food demand. Not only will we have more people to feed, but dietary preferences are also expected to change. When we look at the relationship between average incomes and per capita meat consumption—as shown in the chart below—the trend is strikingly linear. The richer we are, the more meat we tend to eat. We therefore expect that as incomes rise—particularly within low-to-middle income countries, per capita demand for meat and animal protein will follow. Couple the impact of population growth with more meat-rich dietary preferences and we see a continued increase in global meat demand in the coming decades. From one perspective, a rise in animal protein intakes at lower incomes is a sign of progress: where diets are currently deficient in high-quality protein, this could be an essential addition. Nonetheless, this rise in meat demand comes at an environmental cost. Meat production is a largely inefficient, and resource-intensive process. Despite accounting for only 17% of final calorie supply, and 33% of final protein supply, livestock production accounts for 77% of agricultural land use (an area the size of the entire Americas). Agriculture, forestry and land use (ALOFU) accounts for around one-quarter of greenhouse gas (GHG) emissions—per gram of protein, animal products emit between 10-100 times more GHGs than their plant-based counterparts. If global meat consumption continues as projected, it’s expected that by 2050 agriculture alone will take up around 90% of the total carbon budget required to meet our target of keeping average global warming below 2°C. Livestock products are also highly water-intensive: per kilogram, beef requires around 10 times more water than cereal crops. This has important implications for food security as well. 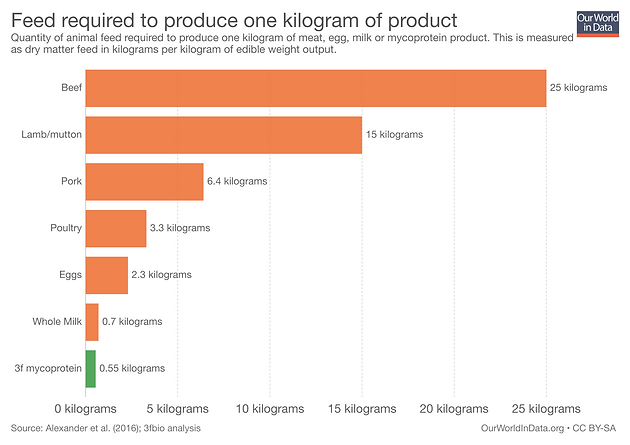 To produce one kilogram of beef requires around 25 kilograms of animal feed. This, alongside the feed conversion ratio (FCR) of other protein products is shown below. Globally 38% of cereals are fed to livestock; in some countries this can reach up to half of all cereals produced. Global trends in meat consumption are therefore environmentally unsustainable. A transformative shift in global diets are needed. protein products need to have a significantly lower environmental footprint than animal-based proteins. 3f mycoprotein offers a unique and transformative solution to the global protein challenge. As a biotechnology solution, 3f mycoprotein cuts through the inherent inefficiencies of animal farming. It delivers a meat-free, high-quality protein similar to the texture of meat, without the environmental footprint. As shown in the chart above, 3f mycoprotein has a transformative feed efficiency: every kilogram of mycoprotein requires only 0.55 kilograms of carbohydrate (starch) feed. This is up to 50 times more efficient than the cow. It also reduces water, land and greenhouse gas emissions by 90-95% relative to beef. Mycoprotein is of similar protein quality to animal products (with a PDCAAS of 0.99) with a complete amino acid profile, but with lower fat and calorie content relative to meats. This offers an important win-win for nutrition: high-quality protein without the negative health impacts of meats. This transformative feed efficiency not only has disruptive impacts to environmental footprint, but also to protein costs. 3f bio mycoprotein aims to deliver the lowest cost, most sustainable protein on the market. Ensuring affordable, high-quality proteins break into lower-income and growing markets is essential to ensure all have equitable access to nutritious diets, as well as incentivising consumers at a global level to transition from meat and animal products. 3f bio therefore delivers a global and scalable solution for sustainable protein which couples inclusive essential nutrition for all with a transformative environmental footprint. This supports a range of the UN’s Sustainable Development Goals (SDGs), including ‘No Poverty’; ‘Zero Hunger’; ‘Good Health’; ‘Reduced Inequalities’; ‘Affordable and Clean Energy’; ‘Climate Action’; ‘Responsible Production and Consumption’; and ‘Life on Land’. Delivering sustainable protein at a global scale will require a major disruption to traditional livestock systems. 3f bio aims to be part of this solution by delivering high-quality protein at the lowest cost—this makes our technology a truly global solution.